I can’t go one week without having pasta. If I ate pasta everyday (I almost did during college), I would be a very, very happy man. To me, pasta is a tradition – a sacred dish that we Americans sometimes overdo and ruin. I’ve had my share of overcooked noodles, Prego sauce, and parmesan cheese from the green can – and I’ll admit I enjoyed those meals. But as I continue to cook, I oftentimes reflect on the origins of a dish. You see, pasta or food in general is not just a way to satisfy one’s appetite. It’s also a way to connect people with long standing traditions and time honored processes. This particular recipe, Spaghetti Carbonara, is made in the way Italian grandmothers and their grandmothers made it. Being able to replicate something like that not only connects me to the heritage of the dish, but shows why great, classic food will never go out of style. Here’s the key to cooking great pasta – after boiling your pasta in salted water (the water should taste like sea water), take it out a minute before it’s done. Then cook the pasta with your sauce so they come together in a perfect union. You must have just enough sauce to lightly dress the pasta – think of how you would dress a salad. Too much sauce, and you’ve taken away the noodle. Too many noodles, and you yearn for the sauce. The great Italian cooks understand that balance and the importance of bringing the noodle and the sauce together. That’s the perfect plate of pasta. It puts a smile on my face. Bring 6 quarts of water to a boil. Add two tablespoons of salt. Meanwhile, combine the olive oil and guanciale or bacon in a large (12 inch) saute pan, set over medium heat, and cook until the guanciale/bacon has rendered its fat and is crispy and golden. Remove from the heat and set aside. Cook the spaghetti in the boiling water until just al dente (usually a minute before your package instructions – so if it says 8 minutes, cook it for 7). Scoop out 1/4 cup of the pasta cooking water and set aside. Drain the pasta. Add the reserved pasta water to the pot with the guanciale, then toss in the pasta and cook, shaking the pan and coating the pasta with the guanciale, for 1 minute. Remove from the heat, add 1 cup of parmigiano, the egg whites, and plenty of black pepper (however much you like! ), and toss until thoroughly mixed. Divide the pasta among four plates. Make a nest in the center of each one, and gently drop an egg yolk into each nest. Season the egg with more pepper and sprinkle the remaining 1/4 cup parmigiano over the top. Serve immediately. *Note – the heat of the pasta will cook the egg yolk, so once you serve, encourage your guests to mix everything together. So many of us used Mario’s recipe this month with our pancetta/ bacon! I will never make carbonara another way again! i so agree about cooking your pasta + sauce together for a bit before serving to combine the flavors perfectly. it makes a huge difference! 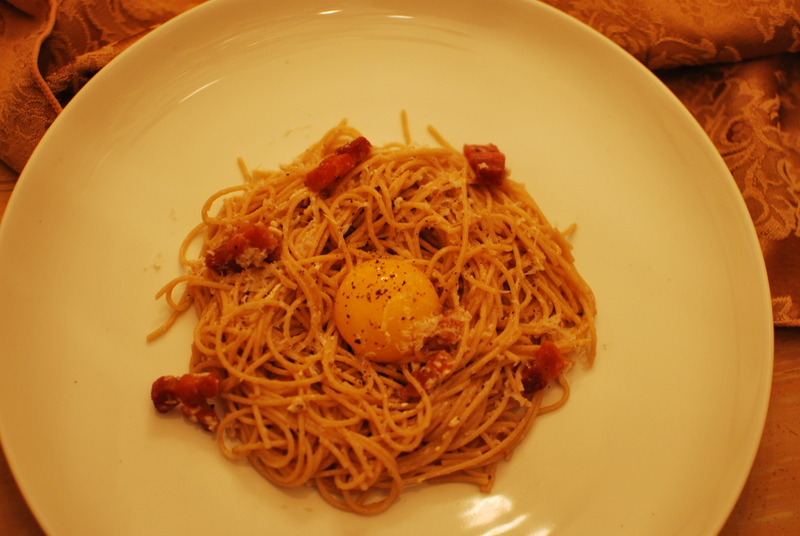 i have made carbonara before, but have never served it with the yolk still intact as i serve it. that’s a lovely presentation of it + i’ll have to try it soon! Yum! Me too, love good pasta (and packaged ramen). The $0.10 ramen pack I adore. I suspect that USA college kids without money all have had a relationship with ramen pack, like myself. As one gets older and has more money, what is that ramen noodle relationship? For me, it is one of my go-to foods for convenience and comfort. Although now, instead of eating the ramen as it is out of the package, I now make it like you recipe, drain the ramen, I will add frozen peas, and egg and sprinkle parm on top before eating. 5 min comfort meal. 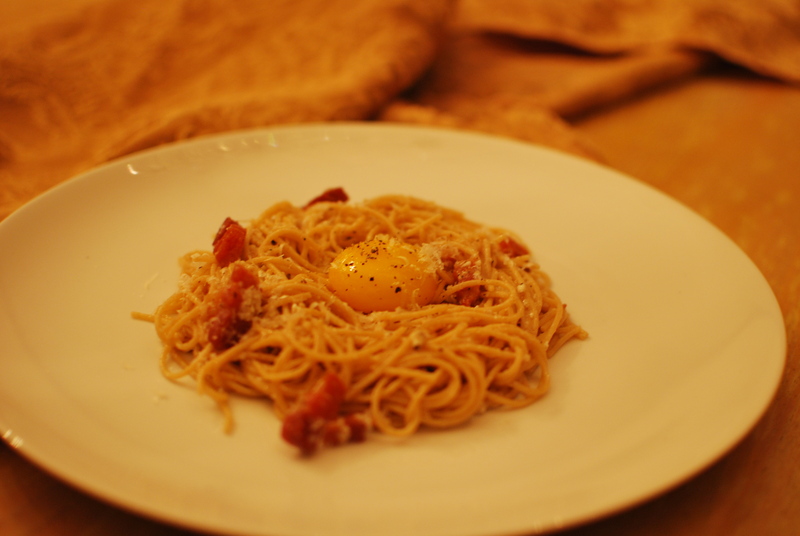 My husband makes carbonara about once a week, but we might need to give this version a try. His recipe has less egg and different cheeses, but I think this eggier version would be amazing! Yeah! It’s an great way to make the classic dish. Since 1 lb of pasta usually feeds 4 people, it ends up being about 1 egg a person. I have another carbonara-esque recipe on the blog in which I put green peas. Even seen one that uses cinnamon. You are a lucky girl to get carbonara once a week!